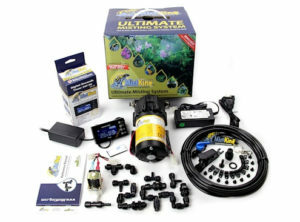 Mist King Ultimate Chameleon Mist System is a professional grade misting system used by Zoos and Botanical Gardens across the world. Buy the #1 Rated Mist System for your new chameleon. This chameleon mist system gives you the freedom to go about your every day life without the worry of having to be home to mist your chameleon. This isn’t just your run of the mill misting system. This chameleon misting system mists with micro fine particles of water so they collect on the leaves without causing water and dripping on your floors. It also comes with a seconds timer. The seconds timer allows you to mist for 10 to 15 seconds. It allows the leaves to drip with water for the chameleon to drink, but not flood your house!